I’m hacking a web app together to quickly create a well-aligned grid of heroes for the picking-stage at the start of a Dota 2 match, so I have something to use while dota2layout.com is down. “hacking”: Yes, this is throwaway code, even though it’s open source. Heck, the main code files are called myMonolithicApp.js and tempHeroesJson.js. “well-aligned”: I prefer my hero layout to be aligned to a grid with some very minor spacing between items. I.e. there’s no option to turn off “snap to grid”. “Dota 2“: Yes, this entire pitch and the tool itself assume you know and play Dota 2. Or that you know me personally and are willing to struggle through the Dota 2 specifics of this post. “so I have something“: The key word being “I”. Even though I’ve shared the app and its source, it was mainly something I created to satisfy my own need. That last point is really rather important here, and it greatly affects the way I want to “wrap up” this project. But before I talk about that, let’s first look at something that seems to be in big contrast with this point. …but in any case, overall comments felt friendly. So even though I wrote the tool for my personal use, deciding to share it seems like a good idea in hindsight. Not quite great code, especially that final (rather frail) line of code, but at least it’s concise, clear, and potentially unit testable. If I were to rewrite the tool I do think I’d need to separate things a bit more. Especially the fact that the internal grid model (which hero sits where) and the rendering bit should be decoupled. This would also be necessary if I were to create a more responsive version that possibly doesn’t use a table for layouting the grid (but either a canvas or a div instead). Keeping it up to date with new heroes as they come out, but only for as long as I feel like it (which highly depends on the amount of Dota I’ll play). That last point does remind me to make one confession: I did not anticipate too well what would be needed to add heroes to the app. 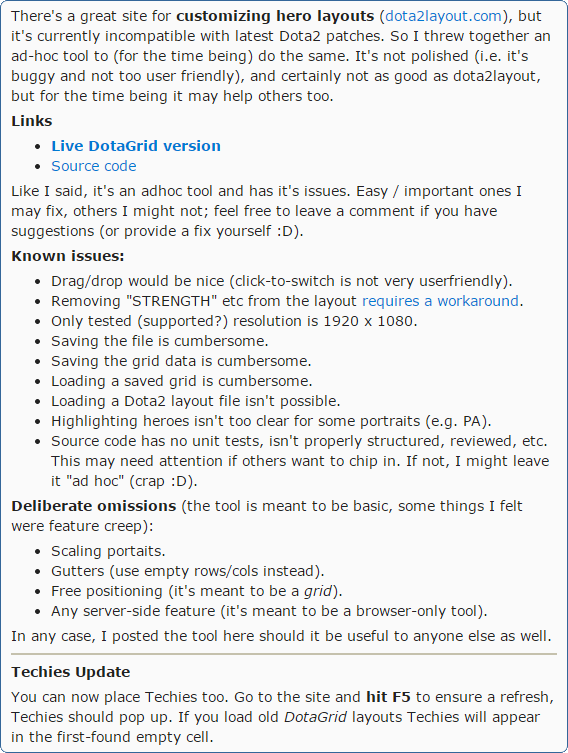 I feel rather dumb about that, since my tool is a direct response to the fact that dota2layout.com broke precisely for that reason. But oh well, you can’t win ’em all.